1) Make sure your document is in the correct format required by the publisher. Please always read the guidelines page before submitting. 2) If your document is not in the correct format, you must convert the document first. The best and most portable output file for a manuscript* is an RTF. 3) If your file is already in the listed format, but Moksha does not accept it, try saving in a different format before submitting. 4) For the best results for manuscripts*, create your document in Microsoft Word or the free Libre Office and save as RTF. Users of Apple Pages may experience errors uploading their converted files. It is highly recommended you use MS Word or Libre Office. * Publishers may opt to allow PDF files and image files, in which case RTF may not be the preferred format. Let’s say you are a publisher and you want to read your submissions anonymously, that is you want to read them “blind” and don’t wish to see the author’s name. Moksha can help you do that. Important note: Moksha cannot control what is in the submitted manuscript. Therefore, make sure you ask your authors to strip out their names and emails (or any identifying information) from their manuscript before submitting. Visit the configuration page for your submission type (Visit the submission type information page and click “Edit”; you must have permission to edit submission types to do this). Make sure you are on the “General” tab. Set the option under “Anonymous submissions” to “Yes” then click “Save” at the bottom. Now when viewing the submissions list, submissions from this type will hide the author’s name. You will see the name “anonymous” instead. Additionally, the author’s name and email will be hidden on the individual submission page. You can click the “Show Name and Email” button to view the hidden name and email, but these fields will be hidden from the user by default. If you want to export your submission data, Moksha makes that easy. Please follow the steps below. Choose “Export” from the “Submissions” menu. Note that you must have permission to export data to view and visit this menu item. Place a check mark next to the publications you wish to export submission data. Then choose the start and ending dates. Finally, click “Download CSV” to save the data. The output is sorted from oldest to newest, but you can use any spreadsheet application to sort the data however you want. After a submission is closed, force authors to wait a certain number of days before they can submit again. Users will see a warning message telling them they must wait X day(s) before submitting again. Limit the number of submissions a person can submit at one time. Users will see a warning message letting them know that they are only allowed to submit X submission(s) at one time. Limit the number of total submissions that can be received. The submission type or publication will automatically close when this limit is reached. If allowed, users will see an optional warning message asking them to confirm. If there is no warning message set, the submission will be accepted. 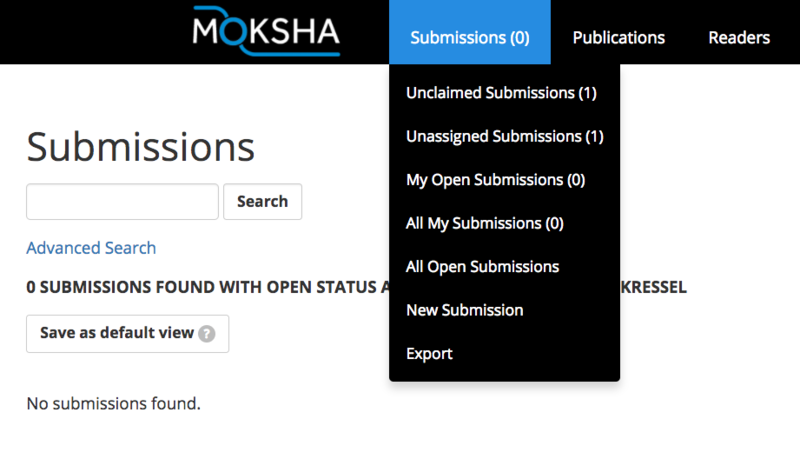 Moksha allows you to throttle submissions for a publication, or by individual submission types. If Submission Throttling is enabled for a publication, this overrides any child submission type throttling settings. 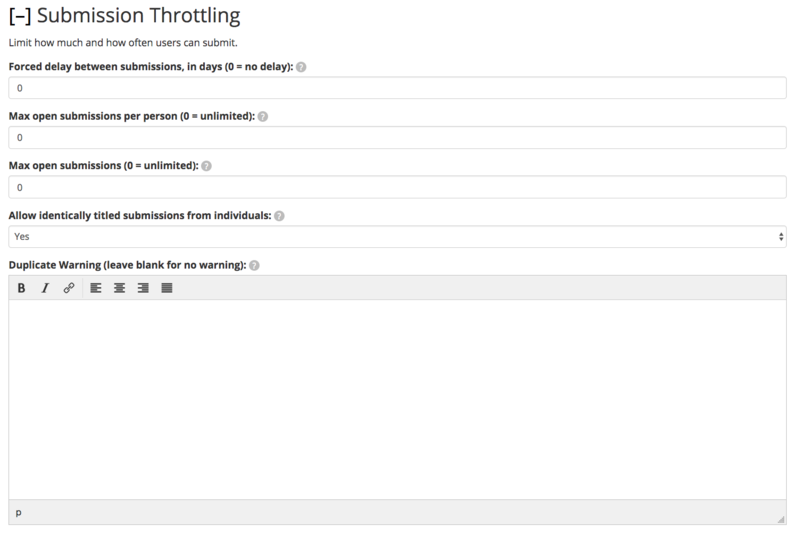 If you wish to have custom throttling settings for each submission type, then you must turn off throttling settings for their parent publication. Question: Does Moksha support charging submission fees for submissions? Nick Mamatas on why he’s Against Submission Fees. Neil Gaiman on Yog’s law. The Rumpus on Reading Fees. We understand that some journals and magazines use submission fees as their primary source of income, and we at Moksha feel this is an unnecessary burden placed on writers as such we do not have plans to ever support it.